Two centuries ago, the Imperium of Man and the upstart Tau Empire fought to a standstill in the Damocles Gulf. Now, as the 41st millennium draws to a close, the tau have returned. 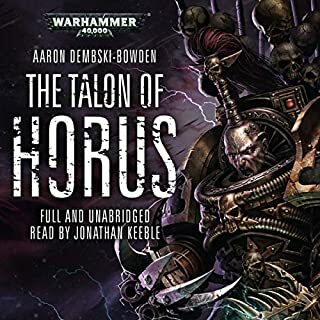 As the world of Agrellan falls under attack, the White Scars and Raven Guard rush to its defence, but with the skilled Commander Shadowsun leading the alien forces, the Space Marines and their allies are hard pressed. 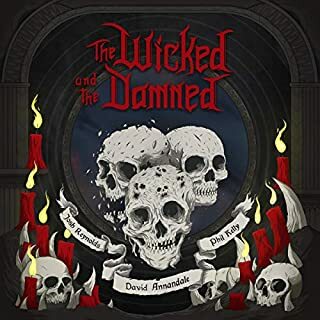 Within this book you will find Hammerhal, a fantastic new novella from Josh Reynolds: Dark forces stir within the bowers of the mysterious Hexwood. A great warhost of Tzaangor beastkin, creatures devoted to Tzeentch, the Architect of Fate, defile the once verdant lands of Ghyran. All that opposes them are the noble Stormcast Eternals of the Hallowed Knights. Reforged in resplendent sigmarite and wielding the lightning of Azyr, few can stand against these heroes. 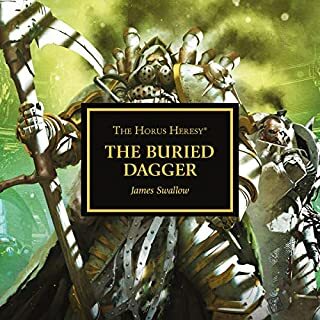 Also within this book is a host of awesome short stories giving you a flavour of the many warring armies that exist within the worlds of Warhammer Age of Sigmar. Sons of the primarch Roboute Guilliman, the Primaris Ultramarines are peerless warriors whose sworn duty is to protect mankind from the predations of the xenos and the foul traitors of the Heretic Astartes. In a galaxy riven by eternal war, they and the other armies of the Imperium are all that stand between mankind and damnation. Their ship damaged by warp storms, the Ultramarines of strike force Cassian make for Kalides Prime. They hope to find safe harbour to repair their craft before rejoining the Indomitus Crusade. Instead, the Primaris Space Marines discover a world reduced to rot and ruin by the plague-ridden warriors of the Death Guard. 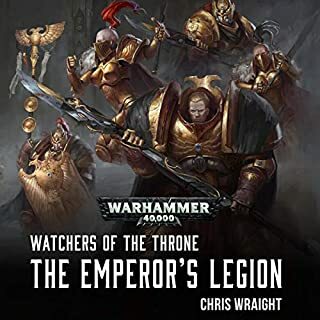 Also within this book is a host of awesome short stories to give you a flavour of the many warring armies that exist within the worlds of Warhammer 40,000. A good intro to the universe. My only problem is that it jumps around in the timeline from 30k to 40k. lightning tower, the last entry was one of the best primarch novel I've ever seen! most of the other stories are very entertaining aswell. 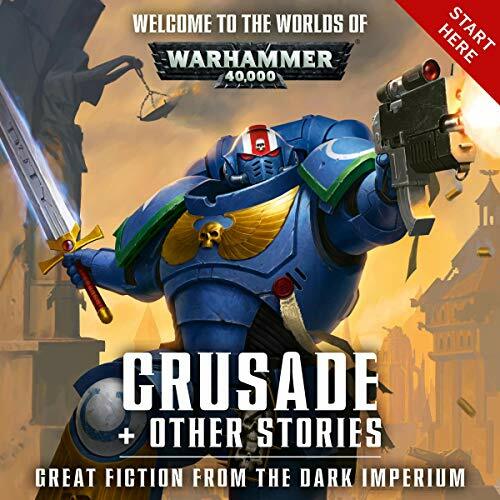 Crusade, the first and longest story of this entry feels like an uninspired commercial for Games Workshop's new product line. 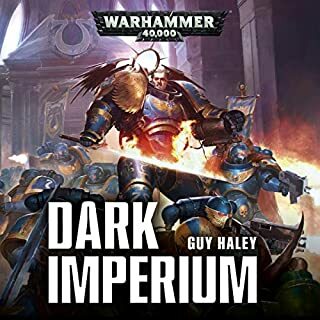 The way the author name drops primaris space marines so often is kind of cringe worthy. All the characters have virtually zero personality even by space marine standards. 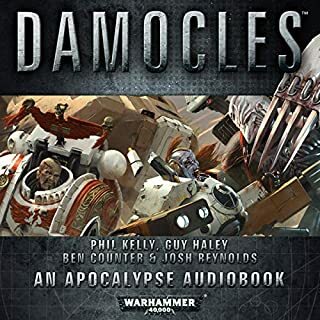 The space marine characters are difficult to distinguish from one and other as the narrator uses the exact same voice for all of them. However everything that comes after that first story is really good. Red & Black, Culling the Horde, Extinction, and The Lightning Tower are some of my personal favorites. Penny Rawlins delivers a particularly great performance in Red and Black. 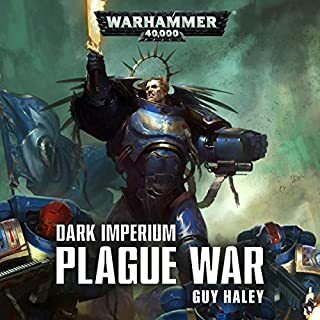 Let me start with, I have read many stories now from the 40k universe. Many of these authors I know are able to pen fantastic stories, giving the best description of this universe and the things that happen throughout it. Honestly, this was a hard struggle to get through. I have never struggled this hard through something that I enjoy so much. Now, let me say, this is not me complaining just to do so. A handful of these stories had me wishing for more the entire time, while others left me wishing they were over the second that they began. Is this a great place to start for those needing a good intro into the world? Yes! Is it something that a long time fan of the world/lore would enjoy? Yes, I think so as well. Honestly, this is just a struggle at times due to the need to present an almost shallow telling of the lore, longing for real depth. 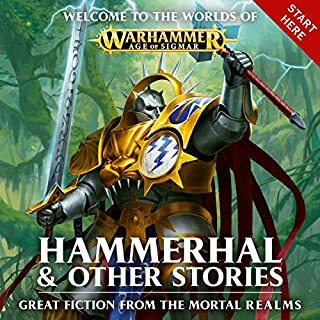 this is a collection of a lot of the short audio plays gw puts out. Some of the stories are ok, most are garbage. I'm glad they made this a collection instead of putting them out individuality, but still this book was rough to make it through. i really wish gw would do more quality control on their authors. I started playing WH40K when "Beakies" were all you could find. I knew Space Marines were the good guys the Eldar were d#@kheads and the Orks killed everything. Now in my 40s my son has started his role as chapter master and these new stories give a great layer of fun and mythology to the game. Josh Banks isn't good at doing multiple voices, all the marines sound the same and it's even worse when he tries to imitate the tinny dialogue from them wearing helmets. Very good group of stories put together from various authors. 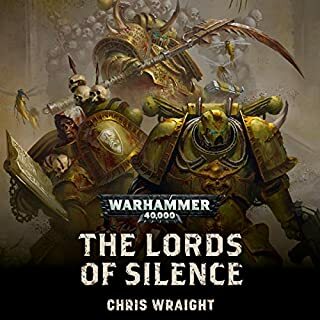 Worth the read or listen for anyone that is a fan of 40k. A great idea but a mixed bag. 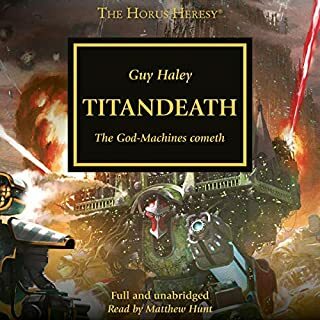 While the stories themselves are quite good they do not flow together easily and rather than get an idea of the shape of the 40k universe they simply repeat the kind of stories more prevalent in the literature. 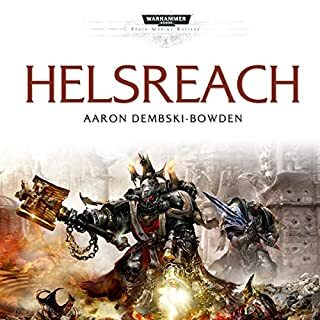 The first is essentially Helsreach in a more compact version while the last story is actually set in the Heresy era. 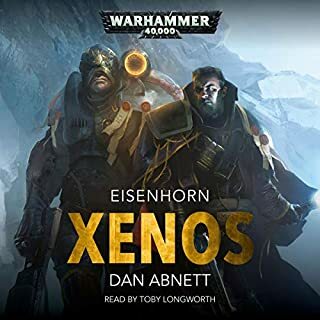 For any newcomer looking to understand the 40k universe Eisenhorn is the best way to begin. 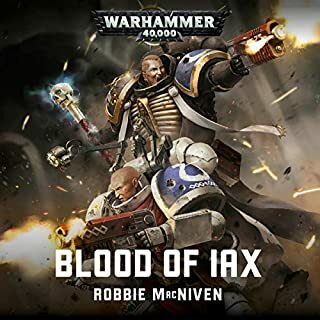 As a straight thriller it uses the background of the 40k universe to great effect rather than trying to get you to go along immediately with the flow. 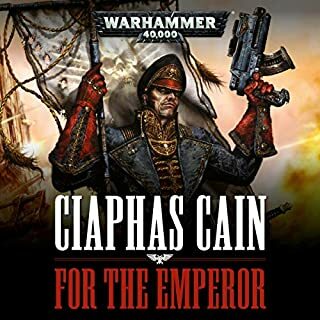 This collection is better for long-time readers as an introduction to different authors and the wider range of literature beyond the Imperium-centred novels. It's not a good place to start with the whole 40k universe. Straight off the bat there is a lot of in universe specific language, which for the uninitiated will probably just be confusing. The stories are OK but nothing more than that. 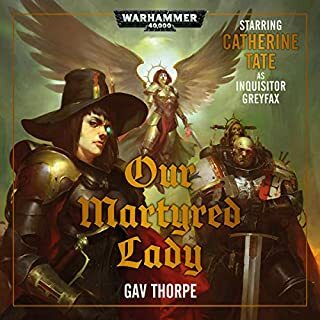 this audiobook masquerades as the next book of watchers of the throne. but in reality there is only one story that contains the primaris space marines. it just recycles old short stories. 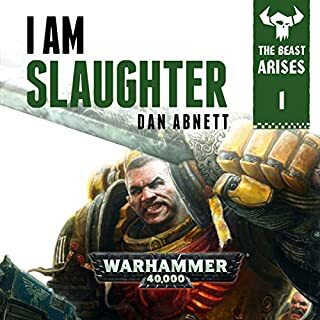 This was a great listen, a great Introduction to 40k lore, the narrator's did a bang up job making it easy to differentiate characters, well worth picking up. all the storys seemed pointless and a little dull only one or two are worth a listen. 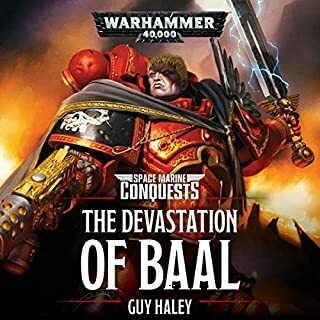 Good if you understand a little of the 40k back story/fluff. Good however it is a bit random with the selection of the stories. Thank you to all the wonderful writers. These amazing adventures shine a narrow beam of light into the Games Worshop universe, illuminating human and non human lives in a time of endless destruction. Crusade and Red and Black, probably the best stories from this collection and that is why it received 4 stars. It was quietly read and it was a struggle to hear at times. John Banks is good and I enjoyed his reading of Pharos but I wonder how I would have enjoyed this if it had been read by Jonathan Keeble or Gareth Armstrong. Some of the stories were so short it almost seemed pointless to even read them let alone listen to them. 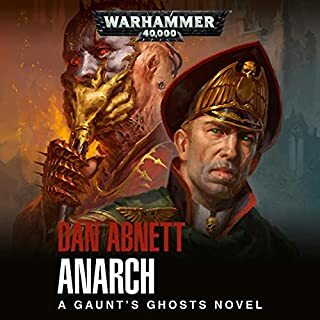 Some good stories and a of them Grim bloody Dark. A good read. A nice glimpse into his domain. So e stories are excellent some..well pretty good. None of them bad.